Beautiful engraved RARE $1000 Gold Bond Specimen certificate from the Remington Arms Company printed in 1922. 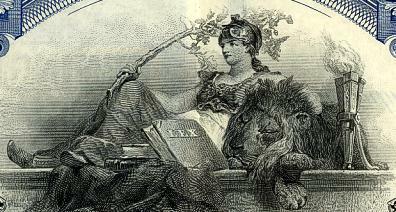 This historic document was printed by the American Banknote Company and has an ornate border around it with a vignette of an allegorical woman sitting and leaning against a lion. Tri folded. 1865 The partnership of E. Remington & Sons was incorporated as a stock company. Over the years, the partnership and the succeeding corporation developed the first hammerless solid breech repeating shotgun, the first hammerless autoloading shotgun, the first successful high-power slide action repeating rifle, and the first lock breach autoloading rifle. In 1865-66, Remington produced the state-of-the-art Rolling Block Rifle. 1867 In an effort to diversify their holdings, Schuyler, Hartley & Graham purchased two small New England cartridge companies. These companies were later closed, and the equipment moved to a new site in Bridgeport, Connecticut. On August 9, 1867, the Union Metallic Cartridge Company was incorporated. It was particularly noted for its development of metallic cartridges. It and its successor company subsequently developed the first paper shotshells successfully manufactured in the United States, the first primer adapted to smokeless powder; the first battery cup for best quality paper shotshells; the first cartridges for automatic pistols; the first standard high-power smokeless cartridges for big game autoloading rifles; the first .410 bore gauge shotshell in the United States; the first nickeled primer; the first oil-proof automatic pistol cartridges; and the first completely wetproof loaded shells, including top wad, crimp and body. 1873 E. Remington & Sons embarked on a new venture, and in September of 1873, the first Remington typewriters were produced. 1886 Remington sells the typewriter business. This business would later become Remington Rand, then Sperry Rand. 1888 In March 1888, E. Remington & Sons was acquired by Marcellus Hartley and partners. E. Remington & Sons was reorganized, and the new company was named the Remington Arms Company. In later years, in order to better utilize the potential of the Remington Plant, the company would produce sewing machines and cash registers. 1912 The Union Metallic Cartridge Company of Bridgeport and Remington Arms Company were combined into one company and became Remington U.M.C. 1915 Construction started on an expansion of the Ilion facilities, and by the spring of 1916, the new Ilion plant was in full operation. The Ilion plant constructed during this time is essentially the same plant that exists today. 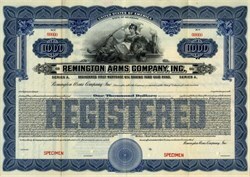 1920 Remington Arms Company was incorporated in Delaware. In order to better utilize the excess manufacturing capacity created during World War I, Remington began to branch into new fields, including the cutlery business (pocket and hunting knives), household utensils, and cash registers. 1926 Remington began distributing and selling decorative patches bearing the Remington logo. This eventually led to Remington's clothing and accessory business. 1931 Remington sold the cash register business to the National Cash Register Company. 1933 As a result of financial pressures brought on by The Great Depression, Remington's management offered a controlling interest in the company to E.I. DuPont de Nemours & Co., Inc. (DuPont). On May 24, DuPont purchased a 60% share of the company. In August, Remington acquired the Chamberlain Trap & Target Company which included a plant in Findlay, Ohio. Its 'Miracle Trap' became a standard in the industry and was used exclusively at the 1934 Grand American Handicap - the premier classic trapshooting event. 1934 On May 15, 1934 Remington purchased the Peters Cartridge Company for $2.5 million. The Peters Cartridge Company operated an ammunition facility located in Kings Mill, Ohio. On June 1, 1934 the assets and business related to the sale and manufacture of the Parker shotgun were purchased from the Charles Parker Company for $100,000. The Parker Shotgun Company operated a facility in Meriden, Connecticut. This operation was later closed and the Parker shotgun production moved to the Ilion plant.